The team will keep trying until they "get it right." Update: In an official statement CCP has clarified that Nova hasn't been entirely cancelled. Instead it "has been taken back into incubation where it continues to evolve". "We’re still committed to providing a rock-solid, integrated gameplay experience set in the EVE Universe. We’re looking forward to revealing more about the game when we feel it’s ready, in due course." Original story: EVE Online developers CCP have tried to establish several spin-off projects over the years—Project Nova is the most recent—and it seems that the studio is not ready to give up quite yet. 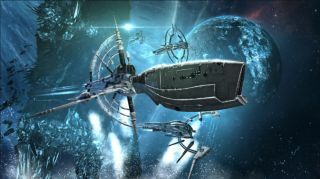 EVE Online has been going now for 16 years and with a firm playerbase, there are only a handful of games that can rival its longevity. So it's really no surprise that creators, CCP have attempted various spin-offs in that time. What is surprising is that they're not at all ready to stop trying and will keep going until they "get it right." At Reboot Develop in Croatia, CCP's CEO Hilmar Veigar Pétursson told the audience that they will "try and fail and try again. For a few more years until we crack it. At CCP we keep at it until we figure it out." If you're curious, you can see what Steven thought of Project Nova when he got to play a demo, last year, shortly before it was put back indefinitely.